Some of the leading newspapers of the country, including The Financial Express and Business Standard wrote about our Partner, CA Sarthak Ahuja, in the papers recently. 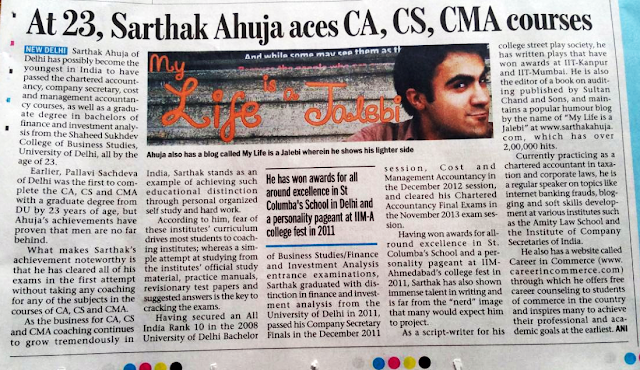 Sarthak Ahuja of Delhi has possibly become the youngest in India to have passed the chartered accountancy, company secretary, cost and management accountancy courses, as well as a graduate degree in bachelors of finance and investment analysis from the Shaheed Sukhdev College of Business Studies, University of Delhi, all by the age of 23. Earlier, Pallavi Sachdeva of Delhi was the first to complete the CA, CS and CMA with a graduate degree from DU by 23 years of age, but Ahuja’s achievements have proven that men are no far behind. 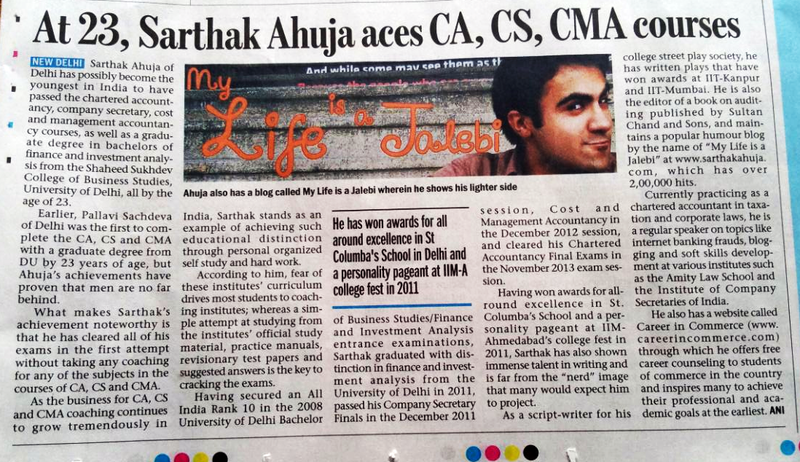 What makes Sarthak’s achievement noteworthy is that he has cleared all of his exams in the first attempt without taking any coaching for any of the subjects in the courses of CA, CS and CMA. As the business for CA, CS and CMA coaching continues to grow tremendously in India, Sarthak stands as an example of achieving such educational distinction through personal organized self study and hard work. According to him, fear of these institutes’ curriculum drives most students to coaching institutes; whereas a simple attempt at studying from the institutes’ official study material, practice manuals, revisionary test papers and suggested answers is the key to cracking the exams. Having secured an All India Rank 10 in the 2008 University of Delhi- Bachelor of Business Studies/Finance and Investment Analysis entrance examinations, Sarthak graduated with distinction in finance and investment analysis from the University of Delhi in 2011, passed his Company Secretary Finals in the December 2011 session, Cost and Management Accountancy in the December 2012 session, and cleared his Chartered Accountancy Final Exams in the November 2013 exam session. Having won awards for all-round excellence in St. Columba’s School and a personality pageant at IIM-Ahmedabad’s college fest in 2011, Sarthak has also shown immense talent in writing and is far from the “nerd” image that many would expect him to project. As a script-writer for his college street play society, he has written plays that have won awards at IIT-Kanpur and IIT-Mumbai. He is also the editor of a book on auditing published by Sultan Chand and Sons, and maintains a popular humor blog by the name of “My Life is a Jalebi” at www.sarthakahuja.com, which has over 2,00,000 hits. Currently practicing as a chartered accountant in taxation and corporate laws, he is a regular speaker on topics like internet banking frauds, blogging and soft skills development at various institutes such as the Amity Law School and the Institute of Company Secretaries of India. He also has a website called Career in Commerce (www.careerincommerce.com) through which he offers free career counseling to students of commerce in the country and inspires many to achieve their professional and academic goals at the earliest.